Quickflix Ltd. (http://www.quickflix.com.au/) is an Australian streaming company offering subscription to a selection of movies and TV shows over a range of smartTVs, games consoles, Blu-ray players, desktops, laptops, mobiles, tablets and other devices. They do their business very badly and is on a constant decline.Streamed titles are very limited and DVDs are often getting lost in transit. To counter this decline and keep profiting, Quickflix revised their business model and devised a scheme. They devised a scheme to profit on their business model’s weakness – lost DVDs in transit. You see, Quickflix, knows that DVDs they distribute get lost all the time. They also know that it’s not always the customers fault that they get lost. Do they care? Of course not! It’s a business opportunity. Heck, they are going down anyway, why not go down with guns blazing! 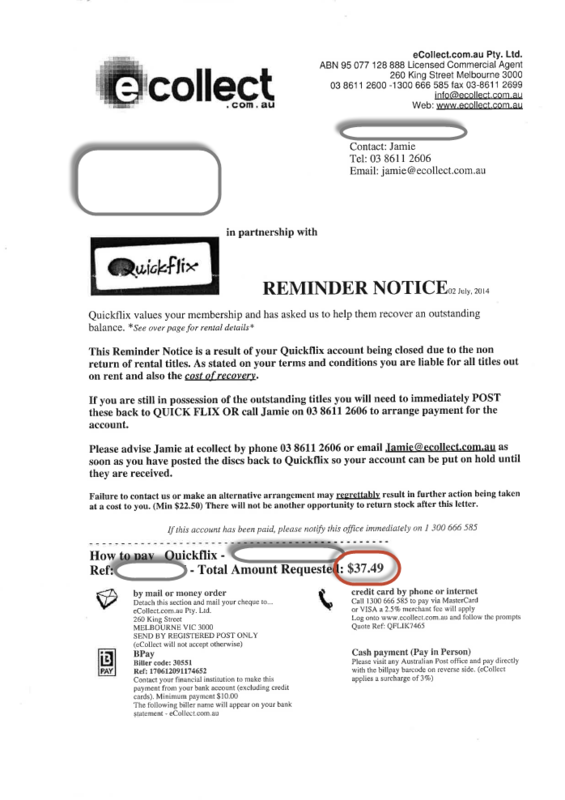 Quickflix charge their customers a ridiculous recovery fee in order to profit from a misfortune. 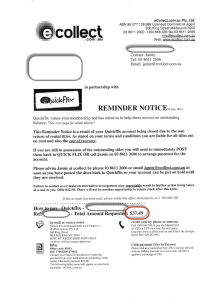 They partnered with ecollect.com.au so Quickflix don’t actually have to do the dirty work. They practically send out thousands of these reminder notices to unassuming customers. Don’t even think about signing up with these crooks. You have been warned.